Never Giving Up On Love is a story of courage, survival and redemption. It is a touching, and at the same time, horrifying saga. 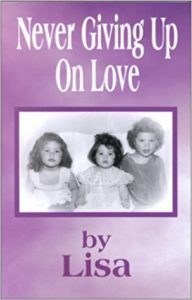 Susan, Lisa and Sheila, three innocent little girls abandoned by their mother, abused by their alcoholic father, and tortured by their aunt, uncle and cousins, carry on a tragic and poignant struggle to keep their identity, and even more, their sanity. The reader is drawn into the terrifying world of child abuse, portrayed with spare, uncompromising descriptions, bleak environments, and images of the vicious and sadistic people who occupy this world, contrasted to the kind and caring ones who are unfortunately few in number in this story, and often seemingly helpless or unwilling to intervene. In her writing, Lisa reveals the horror, anguish and hopelessness of the children’s lives. The book is an important testament which will bring hope and inspiration to those who have suffered this loss of childhood and destruction of innocence. In the salvation through faith which the girls experienced in their lives, they are living proof that God brought them through the atrocities inflicted on them by uncaring adults. Never Giving Up On Love also serves as a wake-up call to those who see the marks of abuse on their fellow human beings, but fail to take action, whether through ignorance, fear, or simple apathy. It is a book which will bring healing to many people, because of its ultimate message, as depicted in the title, the power of redemptive love.